Richard I., King of England, surnamed Coeur de Lion, was the third son of Henry II. and his queen, Eleanor, and was born at Oxford, in the king's manor house there, afterward the monastery of the White Friars, in September, 1157. 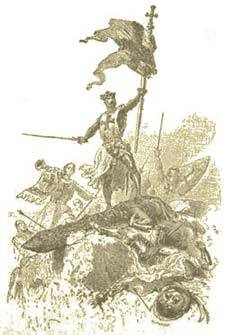 By the treaty of Montmirail, concluded on January 6, 1169, between Henry and Louis VII. of France, it was stipulated that the duchy of Aquitaine should be made over to Richard, who should do homage and fealty for it to Louis, and should espouse Adelais, or Alice, that king's youngest daughter; and in 1170 King Henry, being taken ill at Domfront, in Maine, made a will, by which he confirmed this arrangement. In 1173 Richard, with his younger brother, Geoffrey, and their mother, joined their eldest brother, Henry, in his first rebellion against their father. On the submission of the rebels, in September, 1174, Richard received two castles in Poitou, with half the revenue of that earldom, and, along with Geoffrey, did homage and swore fealty to their father. Nevertheless Richard continued from this time to hold the government of the whole of Aquitaine, and to be usually styled, as before, Duke of Aquitaine, or Duke of Poitou (which were considered as the same title), although it appears that King Henry now looked upon the arrangements made at the treaty of Montmirail as annulled, and that dukedom to have actually reverted to himself. In 1183 Richard refused, when commanded by his father, to do homage for Aquitaine to his elder brother, Henry; on which his brothers Henry and Geoffrey invaded the duchy, and a new war ensued between them and their father, who was assisted by Richard, which, however, was terminated by the death of the eldest of the three brothers in June of that same year, when Richard became his father's heir-apparent. But at an interview between King Henry and Philip Augustus, now King of France, in November, 1188, Richard, apparently impelled by a suspicion that his father intended to leave his crown to his younger brother, John, and also professing to resent his father's conduct in withholding from him his affianced bride, the French king's sister, suddenly declared himself the liegeman of Philip for all his father's dominions in France; whence arose a new war, in which Philip and Richard speedily compelled King Henry to yield to all their demands, and a treaty to that effect was about to be signed when King Henry died, on July 6, 1189. Richard was present at the burial of his father in the choir of the convent of Fontevrault. Notwithstanding his apprehensions, real or affected, of his brother John, Richard made no particular haste to come over to England, but, contenting himself with ordering his mother, Queen Eleanor, to be liberated from confinement, and to be invested with the regency of that kingdom, he first proceeded to Rouen, where he was formally acknowledged as Duke of Normandy on July 20th, and it was August 13th before he arrived at Portsmouth (or, as others say, at Southampton). His coronation, from which the commencement of his reign is dated, took place in Westminster Abbey on September 3d. It was on occasion of that ceremony that a furious riot broke out among the Jews in London, which was in the course of the next six months renewed in most of the great towns throughout the kingdom. At York, in March, 1190, a body of 500 Jews, with their wives and children, having taken refuge in the castle, found no other way of saving themselves from their assailants than by first cutting the throats of the women and children and then stabbing one another. A short time before his father's death Richard, and his then friend, Philip Augustus, had, as it was expressed, taken the cross, that is to say, had publicly vowed to proceed to the Holy Land, to assist in recovering from the infidels the city and kingdom of Jerusalem, which had recently (1187) fallen into the hands of the great Saladin. The mighty expedition, in which all the principal nations of Western Christendom now joined, for the accomplishment of this object is known by the name of the Third Crusade. Leaving the government of his kingdom during his absence in the hands of William Longchamp, Bishop of Ely and chancellor, and Hugh Pudsey, Bishop of Durham and justiciary, Richard took his departure from England on December 11th of this same year, 1189, and proceeding to Normandy, united his forces with those of Philip Augustus in the plain of Vezelay on July 1, 1190. The two friends proceeded together at the head of an army of more than 100,000 men as far as Lyons, where they separated on the 31st; Philip taking the road to Genoa, Richard that to Marseilles, where he was to meet his fleet. The fleet, however, not arriving so soon as was expected, Richard in his impatience hired thirty small vessels for the conveyance of himself and his suite, and, sailing for Naples, arrived there on August 28th. On September 8th he proceeded by sea to Salerno, where he remained till the 23d, and then sailed for Messina, which port his fleet had reached about a week before, with the army, which it had taken on board at Marseilles. The French king had also arrived at Messina a few days before his brother of England. Richard at the Battle of Arsur. The two kings remained together at Messina till the end of March, 1191. During their stay Richard compelled Tancred, who had usurped the crown of Sicily, to relinquish the dower of his sister Joan, the widow of William, the late sovereign, and to pay him besides forty thousand ounces of gold. In return he betrothed his nephew, Arthur, the son of his next brother, Geoffrey, to Tancred's infant daughter, and formed a league offensive and defensive with the Sicilian king--a connection which afterward cost him dear, for it was the source of the enmity of the Emperor Henry VI., who had married Constantia, the aunt of William, and claimed the throne of Sicily in right of his wife. After the dispute with Tancred had been settled, the latent rivalry of Richard and Philip broke out in a quarrel about the Princess Adelais, whom her brother Philip insisted that Richard should espouse, in conformity with their betrothment, now that his father no longer lived to oppose their union. But if Richard had ever cared anything for the French princess, that attachment had now been obliterated by another, which he had some years before formed for Berengaria, the beautiful daughter of Sancho VI. (styled the Wise), King of Navarre; in fact he had by this time sent his mother Eleanor to her father's court to solicit that lady in marriage, and, his proposals having been accepted, the two were now actually on their way to join him. In these circumstances Philip found himself obliged to recede from his demand; and the matter was arranged by an agreement that Richard should pay a sum of ten thousand marks, in five yearly instalments, and restore Adelais, who had previously been conducted into England, and the places of strength that had been given along with her as her marriage portion, when he should have returned from Palestine. Richard, having sent his mother home to England, sailed from Messina on April 7th, at the head of a fleet of about two hundred ships, of which fifty-three were large vessels of the sort styled galleys; his sister, the queen dowager of Sicily, and the Princess Berengaria accompanying him. The King of France had set sail about a week before. Several months, however, elapsed before Richard reached the Holy Land, having been detained by an attack which he made upon the island of Cyprus; Isaac, the king, or emperor, of which had ill used the crews of some of the English ships that had been driven upon his coasts in a storm. Richard took Limasol, the capital, by assault; and that blow was soon followed by the complete submission of Isaac and the surrender of the whole island. Isaac was put into confinement, and remained a captive till his death in 1195. Meanwhile the island of Cyprus was made over by Richard, in 1192, to Guy of Lusignan, upon his resignation of the now merely titular royalty of Jerusalem to his rival Henry of Champagne and Guy's posterity reigned in that island till the year 1458. Having married Berengaria at Limasol, Richard set sail from Cyprus, on June 4th (1191), with a fleet now described as consisting of thirteen large ships called busses, fifty galleys, and a hundred transports; and on the 10th he reached the camp of the crusaders assembled before the fortress of Acre, the siege of which had already occupied them not much less than two years, and had cost the lives, it is said of nearly two hundred thousand of the assailants. But the presence of the English king, although he was suffering from severe illness, and had to be carried to the trenches on a litter, immediately inspired so much new vigor into the operations of the Christian army that, on July 12th, the place surrendered, and Saladin, who had been harassing the besiegers from the neighboring mountains, withdrew, in conformity with the terms of capitulation. This great event, however, was immediately followed by an open rupture between Richard and King Philip, whose rivalry had already exhibited itself in a variety of ways, and more particularly in the support given by Richard to the claim of Guy of Lusignan, and by Philip to that of Conrad of Montferrat to the vacant crown of Jerusalem. Philip, in fact, took his departure from Palestine on the last day of July, leaving only ten thousand men, under the command of the Duke of Burgundy. 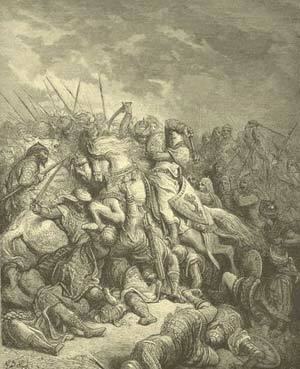 Richard performed prodigies of valor in the Holy Land, but, although a signal defeat of Saladin on September 7th at Arsur was followed by the capture of Jaffa and some other places of less importance, Jerusalem, which was the main object of the crusade, so far from being taken was not even attacked. Jaffa, however, after it had again fallen into the hands of Saladin, was recovered by the impetuous valor of the English king. At last, on October 9, 1192, Richard set sail from Acre in a single vessel, his fleet, having on board his wife, his sister, and the daughter of the captive King of Cyprus, having put to sea a few days before. The three ladies got safe to Sicily; but the first land the king made was the island of Corfu, which he took about a month to reach. He left Corfu about the middle of November with three coasting-vessels which he hired there; but after being a few days at sea he was compelled by a storm to land on the coast of Istria, at a spot between the towns of Aquileia and Venice. After narrowly escaping first from falling at Goritz into the hands of Maynard, a nephew of Conrad of Montferrat (to whose murder in Palestine Richard, upon very insufficient evidence, was suspected to be an accessory), and then at Friesach from Maynard's brother, Frederick of Batesow, he was taken on December 21st, at Erperg, near Vienna, by Leopold, Duke of Austria (a brother-in-law of Isaac of Cyprus), and was by him consigned to close confinement in the castle of Tyernsteign, under the care of his vassal, Baron Haldmar. In the course of a few days, however, by an arrangement between Leopold and the Emperor Henry VI., the captive king was transferred to the custody of the latter, who shut him up in a castle in the Tyrol, where he was bound with chains, and guarded by a band of men who surrounded him day and night with drawn swords. In this state he remained about three months. Meanwhile, intelligence of his having fallen into the hands of the emperor had reached England, and excited the strongest sensation among all ranks of the people. It is sufficient to mention that during his absence a struggle for supremacy had for some time been carried on with varying success between the king's brother, John, and Longchamp, the chancellor, who had acquired the entire regency, and had also been appointed papal legate for England and Scotland; and that this had resulted, in October, 1191, in the deposition of Longchamp, by a council of the nobility held in St Paul's Churchyard, London; after which he left the country, and although he soon ventured to return, ultimately deemed it most prudent to retire to Normandy. The supreme authority was thus left for a time in the hands of John, who, as soon as he learned the news of his brother's captivity, openly repaired to Paris, and did homage to the French king for the English dominions on the Continent. On returning to England, John raised an army to support his pretensions, while his confederate, Philip, took up arms in his behalf in France, and, entering Normandy, overran a great part of that duchy, although Rouen, the capital, was preserved principally by the exertions of the Earl of Essex, lately one of Richard's companions in the Holy Land. In England, also, John met with a general opposition to his usurpation of the regal authority, which soon compelled him to conclude an armistice with a council of regency that had been appointed by the prelates and barons. This was the position of affairs when Longchamp, having discovered Richard's place of confinement, after much solicitation prevailed upon the emperor to allow the royal prisoner to be brought before the diet at Hagenau, where, accordingly, he made his appearance on April 13, 1193, and defended himself with so much eloquence against the several charges made against him in regard to Tancred and the kingdom of Sicily, to his conquest of Cyprus, and to the murder of Conrad of Montferrat, that Henry found himself compelled by the general sentiment of the diet to order his chains to be immediately struck off, and to agree to enter upon negotiations for his ransom. Longchamp was immediately despatched to England with a letter to the council of regency, and the result was, that, notwithstanding the insidious efforts both of John and his friend, Philip of France, to prevent the conclusion of the treaty, Richard was at last liberated, on February 4, 1194, after seventy thousand marks had been actually paid to the emperor, and hostages given for the payment of thirty thousand more. The English king had also engaged to release both Isaac of Cyprus and his daughter, and he had besides, at the persuasion, it is said, of his mother, Eleanor, the more effectually to conciliate Henry, formally resigned his crown into the hand of the emperor, who immediately restored it to him to be held as a fief of the empire, and burdened with a yearly feudal payment to his superior lord of five thousand pounds. This strange transaction rests on the authority of the contemporary annalist Hoveden. Richard, descending the Rhine as far as Cologne, proceeded thence across the country to Antwerp, and, embarking there on board his own fleet, landed at Sandwich on March 13th. Most of John's strongholds had been wrested from his hands before his brother's return, and now the rest immediately surrendered and he himself fled the country, and with his principal adviser, Hugh, Bishop of Coventry, having been charged with high treason, and not appearing to plead after forty days, was outlawed and divested of all his possessions. Meanwhile it was thought necessary that Richard should be crowned again, and that ceremony was accordingly performed at Winchester by Hubert, Archbishop of Canterbury, on April 17th. Then, leaving Hubert guardian of England and grand justiciary, on May 2d, following, having, with his characteristic activity employed almost every moment since his arrival in raising an army and procuring funds for its maintenance by all sorts of exactions and the most unscrupulous use of every means in his power, he again set sail from Portsmouth, his whole soul bent on chastising the King of France. Owing to adverse winds he was a fortnight in reaching Barfleur, in Normandy, where, as soon as he landed, he was met by his brother John, who professed contrition and implored his pardon, which, on the intercession of his mother, Eleanor, was granted. Richard now marched against Philip, and several engagements took place between them, in most of which the English king was successful. But the war, though it lasted for some years, was distinguished by few remarkable events. A truce for one year was agreed to on July 23d, and although hostilities were resumed some time before the expiration of that term, a peace was again concluded in the end of the following year, which lasted till the beginning of 1197. All this time Hubert, assisted by Longchamp, who had been restored to his office of chancellor, is said to have presided over the government at home with great ability. Hubert had been educated under the famous Glanvil, and he seems, in the spirit of his master, to have exerted himself in re-establishing and maintaining the authority of the law, by which alone, even if he did no more, he must have materially contributed to the revival of industry. The large sums, however, which he was obliged to raise by taxation to meet the expenses of the war, in the exhausted state to which the country had been reduced provoked much popular dissatisfaction; and the third year of the king's absence in particular was distinguished by the remarkable commotion excited by William Fitz-Osbert, styled Longbeard, a citizen of London, who is admitted to have possessed both eloquence and learning, and whose whole character and proceedings might not improbably, if he had had his own historian, have assumed a very different complexion from what has been given to him. Longbeard, who acquired the names of the Advocate and King of the Poor, is affirmed to have had above fifty thousand of the lower orders associated with him by oaths which bound them to follow whithersoever he led. When an attempt was made to apprehend him by two of the wealthier citizens, he drew his knife and stabbed one of them, named Geoffrey, to the heart, and then took refuge in the church of St Mary-le-Bow in Cheapside, the tower of which he and his followers fortified, and held for three days, when they were at last (April 7, 1196), dislodged by fire being set to the building. Fitz-Osbert was first dragged at a horse's tail to the Tower, and then to the Elms in West Smithfield, where he was hanged, with nine of his followers. The people, however, long continued to regard him as a martyr. The war between Richard and Philip broke out again in 1197, and in the course of this campaign Richard had the gratification of capturing the Bishop of Beauvais, a personage whom he had reason to regard as a main instigator of the severities and indignities which he had sustained at the hands of the emperor. The bishop was taken armed cap-a-pie and fighting, and when Pope Celestine recommended him to the clemency of Richard as his son, the English king sent his holiness the bishop's coat of mail, with the following verse of Scripture attached to it: "This have we found; know now whether it be thy son's coat, or no." This same year, too, finished the career of the Emperor Henry, who, in his last moments, is said to have expressed the extremest remorse for the manner in which he had treated the great champion of the Cross. Richard's other enemy, Leopold, Duke of Austria, had been killed by a fall from his horse two years before. A truce, as usual, at the end of the year, again suspended hostilities for a space. The war was renewed on its termination, and in this campaign (of the year 1198) Richard gained one of his greatest victories near Gisors, when Philip in his flight fell into the river Epte, and was nearly drowned. After this, by the intercession of the Pope's legate, a truce was concluded between the two kings for five years, and they never met again in fight; although they probably would, notwithstanding the truce, if both had lived. But on March 26th in the following year, 1199, as Richard was engaged in reducing the castle of Chaluz, the stronghold of one of his Aquitanian vassals, Vidomar, Viscount of Limoges, who it seems had refused to surrender a treasure found on his estate, to which the king laid claim in right of his feudal superiority, Coeur de Lion was struck in the left shoulder by an arrow, aimed from the rampart of the castle by a youth named Bertrand de Gurdun. The wound would not have been dangerous but for the mismanagement of the surgeon in his attempts to extract the arrow-head, which had broken off in the flesh. As it was, Richard lived only till Tuesday, April 16th. The shot was a fatal one in every way; in the fury into which the wound of the king threw the besieging army the castle was taken by storm, and all the persons found in it were immediately hanged, as some authorities say, by the king's orders, with the exception only of Gurdun. He was brought into the presence of his dying victim, when Richard, under the impulse of generosity or compunction, gave him his liberty, with a hundred shillings to take him home; but after the king's death he was flayed alive, and then hanged, by order of Marchadee, the leader of the Brabantine mercenaries serving in Richard's army. The character of Richard is, of course, not to be judged without reference to the general manners of the age in which he lived. It is probable enough that there was hardly an excess, either of violence or licentiousness, into which his impetuous temperament did not occasionally precipitate him; but he seems to have had nothing base or malignant in his composition; and that he was as capable of acts of extraordinary generosity and disinterestedness as of excesses of brutal fury or profligacy. Of the courage and strength of will proper to his race, he had his full share, with more than his share of their strength of thew and sinew; and his intellectual powers, both natural and acquired, were also of a high order. He was renowned in his own day not only as beyond all dispute the stoutest and most gallant of living heroes, but as likewise occupying a place in the foremost rank of those who excelled in wit, in eloquence, and in song.